Factor of «power» and the threat of use of force have always been an integral part of history of humanity. According to scholars and historians over the last 5000 years there happened more than 14 thousand wars on our planet that have killed nearly 4 billion people. During the ХХth century mankind has gone through two major world wars, numerous revolutions, overthrow of colonial and socialist systems, as a result of political motives more than 170 million people have been killed [‎25]. Modern scientific and expert community of political analysts, historians, specialists in international affairs, social analysts, conflictologists and researchers of other fields of social life comprehending these tragic processes proposed a number of diverse hypotheses, doctrines, theories and concepts that from different perspectives examine the issue of «power» in international relations and offer proactive strategies to resolve conflicts without use of power factor. Usually, the power of the state was identified first of all by its military might. For the first time the factor of «power» as a substantial category determining the behavior of states in the international arena was presented by a Greek philosopher Thucydides in his book «History of the Peloponnesian War» [‎23, p. 52]. In the ХХ century the basic concept formulating the phenomenon of «power» was given by an American researcher R.Dahl, who among the first modern researchers has defined the power as the ability of one of the actors of the international relations to force the other for certain behavior model, which the latter would not otherwise do without coercion [‎5, p. 203]. By definition of R.Dahl the concept of «power» should be considered through the behavior of international actors as a description of capacities of an actor of international relations and the ability of the latter to use the selected capacities to change the behavior model of other actors. In the opinion of W.Kaufmann, a scholar of Princeton University (USA), only a military power serves as a baseline for political prestige and economic authority of the state. «It can be argued that the power factor became a driving motive for implementation of foreign policy strategies of actors of international relations. It is difficult to imagine the development of international relations without the influence of military powers» - noted the American scholar [‎8, p. 242]. For H.Morgenthau, who is commonly accepted as the «patriarch» of American school of political realism, the force is first and foremost a tool of governing the world and power over the minds and actions of people. In his theory the scholar does not differentiate such concepts as force, might, power and influence, regarding them as synonymous while the main content of his research works can be represented in formula that «International politics, like all politics, is a struggle for power» [‎10, p. 97]. His colleague John Stossinger, an American political analyst, regards the category of power in international relations as the capacity of a state to use effectively its real resources and potential with the purpose to impact the lifestyle, system of values and behavior of other states [‎17, p. 27]. R.Cline, an American analyst, the author of a book «World Power Assessment», argues that power of international actors lies first of all in their capacity through involvement of tools of persuasion, coercion and open use of military force to persuade certain actor to take such political decision, which he otherwise would not adopt [‎3, p. 8]. In addition, a British philosopher B.Russel considers power as a method to get desired results [‎15, p. 25]. Consequently, on a common denominator of the mentioned definitions of category of «power» in international relations there is a unified baseline component, - «the capacity of the state with maximum benefit for its national interests to shape the behavior of another state or group of states against their will through the use of various forms of pressure or dependence». However, at the present historical stage the scientific-theoretical interpretation of «power» notion has been further developed within the concept of «hard», «soft» and «smart power», this notion was pioneered by Joseph Nye. In this context under the notion of «hard power» the American scholar understands «the ability to use the principle of the «carrot and stick» approach». That has been acknowledged by military and economic might of the state with the aim to force certain countries to follow the desires and requirements of other actors of international relations» [‎7]. «Hard power» should be viewed as a combination of tools of economic and efficient military pressure in furthering pragmatic goals to advance national interests by oppressing and restricting other actors of international relations through political, economic or military means. The scholar defines the «soft power» notion as a process when the actor of action expands the power and influence on other entities without coercion and pressure. First of all, the understanding of «soft power» notion is based on attractiveness of an actor. Thus, the researcher considers that foreign policy may be able to achieve the desired goals without the use of military force or economic sanctions, only through the influence of cultural, scientific, diplomatic and educational factors. «We know that military and economic might often get others to change their position. ... Hard power can rest on inducements or threats. But sometimes you can get the outcomes you want without tangible threats or payoffs» [‎13, p.34], - said the scholar. According to Joseph Nye’s definition «smart» power rests primarily on the ability to shape «hard» and «soft» power into an effective strategy [‎12, p. 43]. Examining the structural elements of the category of «power» and presenting the definition of the imperative of «power» through the qualitative characteristics of such components as «hard», «soft» and «smart» power we offer to conduct a comprehensive analysis of the impact of one of the key component of the category of «power»: namely, the «energy power» on the implementation of Russia’s geopolitical objectives in the Eurasian theatre. Over the last decades Moscow European policy has been characterized by full-scale use of the energy factor as an effective instrument of power and effective leverage in promoting and consolidating Russia’s geopolitical interests in Eurasian continent and worldwide. As noted in our monograph «The United States and the Russian Federation in the Persian Gulf: allies and rivals» [‎22], the use of power factor as extremely meaningful component of «hard power» in foreign policy along with military pressure and economic sanctions recently has acquired a system-wide approach. In particular, the energy component is actively used by the Russian Federation in modern international relations system, strongly shaping main directions and defining the content of Moscow foreign policy strategy. Power vector acts increasingly as an independent factor and the most effective and important tool of foreign impact in the relationship of actors of international relations. Importantly, however, that under certain market conditions or as a result of artificial modeled situation on the world market the power factor can be used effectively both as a powerful tool of influencing the economy of energy-dependent state and act as an effective instrument of pressure on socio-economic situation in the territory of large energy exporter state. Thus, taking into account the impact and variety of ways to better use of power factor and types of its application in the geopolitical rivalry of the states it is logical to view the power factor as a meaningful component of «hard power» along with military actions and economic pressures. However, the model of applying the energy factor as a tool of «power» in promoting Russia’s strategic interests in the European theater has its own distinctive features and characteristics. In our survey let’s try to raise the issues which the European Community face in the energy sector and outline possible solutions. We will examine the sequence of actions and focus of Russia’s ambitious foreign policy efforts in its attempt to create viable system of neo-colonial power relations on the Eurasian continent, consider the Kremlin’s proven measures for achieving its intended objectives and practical implementation of the above-named ideas. Also, we will try outlining the most likely in our opinion options of resistance and possible ways of Europe’s effective countering Russia’s energy expansionism. One of the extremely important components in introduction and encouraging of Russia’s imperial ideology in European international relations certainly is the power factor, since about two-thirds of energy exports falls on the European Union states [‎2]. In fact, the EU has to import almost half of amount of energy sources to meet the living needs. At that, 6 Member States (Bulgaria, Estonia, Finland, Latvia, Lithuania and Sweden) are now 100% dependent on imported Russian gas supplies (Fig. 1). Thus, according to these data, given that a quarter of the EU member states is not dependent on Russian gas, at the same time almost one out of five countries of the European community is totally dependent (100%) on Moscow natural gas supplies. The rest of the states can be divided into category of larger dependents of Russian gas imports (by 50% or more), these are the six countries in Europe and a group of states less dependent of Russian gas (less than 50%), of about a third. Currently, European countries cover their energy needs by 37% from domestic resources, a share is imported from Norway and Algeria and about 40% of hydrocarbons imports to the EU are accounted for Russia’s monopoly supply. Examining the stated issue we suggest exploring the correlation between Russia’s pricing policy and import volume and long-distance transport of Russian gas across the EU states. According to the «Gazprom» data Fig. 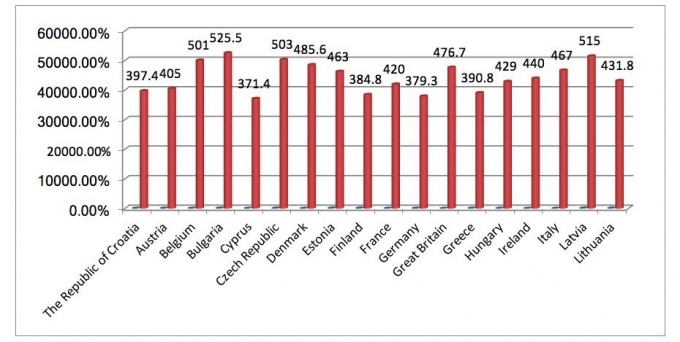 2 presents proportion of prices for Russian natural gas to the European Union countries. It is impossible to avoid some misunderstandings about the transparency and impartiality of the «Gazprom» pricing policy comparing the EU states’ natural gas purchases with the price level set by bilateral agreements with state business entity of the Russian Federation taking into account the terms and extent of transportation of energy recourses. In addition, there is a concern about numerous cases of leakage of information concerning classified annexations to the energy contracts with secret agreements about the discounts for selected EU countries on Russian hydrocarbons. Secrecy and lack of obvious relationship in the energy sector between Russia and some EU states leads to the assertion that there is a political component in the economic relationship of actors of the energy market. It is also interesting that European countries being the most energy dependent from Moscow purchase Russian gas in volumes from 50 to 100% and in the end have the highest bidder on carbohydrate product - from USD 429 to 525.5 per 1000 cubic meters (with the exception of Finland, which is buying 100% of Russian gas for USD 384.8. per 1000 cubic meters of natural gas). It is hard to agree the energy pricing model on the European energy market proposed by Russian «Gazprom» with the laws of economics and markets. Indeed, by simple logic, the greater is the amount of certain goods the actor of business relationship buys the lower is the cost of this product. However, in case of Russian gas supply to the European market it is difficult to explain the logic of economic justification of prices. As a result, Russian gas for the European economy is no more an ordinary market product for export turning a tool of political influence and leverage of economic pressure from the Kremlin. In current challenging conditions of global financial crisis the Russian Federation uses effectively the power factor for implementation of its European policy as a destabilizing force in the domestic politics of the Euro-zone and strong barrier to adoption of the EU agreed strategic decisions in the field of international relations. So, using «the language of figures» even in spite of all possible explanations in terms of loyalty of Russian monopoly for individual countries of the European community, the current situation in the European energy market serves not in favor of the EU being a powerful supranational association and self-sufficient actor of international relations. Let’s sum the comment up with the following set of theses: first, Moscow, using a system of «floating» energy prices and granting special discounts and price benefits combined with a wide range of other benefits for certain European countries focused on forming a coalition of loyal «pro-Russian’ states» in Euro space. Today, these actors of international relations from a list of selected countries with interest in maintaining the existing status quo at the European energy market are ready to compromise certain EU priorities for economic benefits of their countries in the system of geopolitical relations at regional and global levels. Thus, Russia creates preconditions that complicate the development of unified position of European states in geopolitical matters, depriving the EU of countering Russia’s imperial response and aggressive energy policy worldwide; secondly, the Kremlin with its rationalism skillfully using the power factor pushes the EU states to unhealthy destructive internal competition within the supranational institution. The mentioned destructive foreign influence is a direct threat to coherence and agreed position of the European Union on the international stage and creates a warning to activities of the EU as a major independent player at the global level. As a result, in the frame of the association there appear externally imposed inconsistencies and multi-vector «centers of influence» are being formed. Their interaction in certain EU domestic and foreign policy issues is more of competitive nature rather than of partnership approach. This strategy enables Russia to use smartly all available and artificially inspired controversy in Europe states’ relationship for moving forward its own geo-strategic objectives and implementing global political projects. In this connection it would be appropriate to quote a statement of Ariel Cohen, an American scientist of the analytical center at the Heritage Foundation (USA) focusing on Russian and Eurasian Studies and energy security. In his publications in 2007 Cohen warned the community about Russia’s pursuing «special policy of energy dependence» concerning the European Union. "Moscow is pursuing a comprehensive strategy that could increase Europe's political and economic dependence on Russian energy. Such dependence could negatively affect transatlantic relations, common values, goals, strategic objectives, and security policies) [‎4] - the expert argued. L.Chekalenko, a Ukrainian researcher in energy security having agreed upon Cohen’s key issue regarding a specially developed Russia’s plan for «energy dependence of the EU» drew attention to the lack of a unified energy policy of euro space countries. «It was surprising to realize the EU dependence on energy resources mainly of one country and slow steps in search of alternative sources of energy. These factors form the negative situation of the European energy market, leading to irreparable distortions in the energy policy of each state that brings imbalance to a single energy policy of the European Union» [‎24] - concludes L.Chekalenko. Against the background of excessive energy dependence of the majority of the EU states, only the Czech Republic and Poland can boast a certain domestic coal mining volumes, Denmark and the UK have a natural oil and gas, and the Netherlands have gas reserves. That is why the issue of forming a common EU energy policy has been the subject of constant close attention of the European Community. In this respect the legal and regulatory activity demonstrated by the European Union over the last few decades has been sufficiently illustrative. In particular, in 1994 the Energy Charter Treaty and Energy Charter Protocol on energy efficiency and related environmental aspects were signed; in 1995 objectives of energy policy for the near future entered into the so-called White Paper of the EU such as establishment of effective domestic energy market to an ensure uninterrupted power supply, solving problems of environmental impacts of the energy sector, etc. ; in 1998 the Energy Charter Treaty came into force, which marked the beginning of the common EU energy policy; in 2002 the key objectives of the EU Green Paper included provisions for the development of the domestic gas market and electricity, revision of existing storage practices of oil and gas, increasing the transparency of energy supply, providing reliable security of energy grid, diversification of energy sources; in 2004 the EU Directive concerning measures to safeguard security of natural gas supply entered into force; in 2006 a European Strategy for Sustainable, Competitive and Secure Energy was approved; in 2007 the «Energy policy for Europe» plan came into force and so on. However, at present a thorough work carried out in regard of organizational and legal support of the EU states energy independence, unfortunately, did not bring fundamental changes in the European market of raw hydrocarbons. In fact, at the present the lion's share of oil and gas volumes necessary to ensure the sustainable functioning of the EU economy and the euro zone continues to rely solely on Russia’s supplies of mentioned fuels. Today, three major pipeline systems carry Russian gas to the European Union states; the «Yamal - Europe» pipeline runs through Belarus; the «Urengoy-Uzhgorod» pipeline passes through the territory of Ukraine and the «Nord Stream» pipeline laid on the bottom of the Baltic Sea. Based on objective factors enabling to balance the energy market, European countries are in constant active search for alternative sources and routes of hydrocarbons supply. In the early 2000s, in order to minimize the gas dependence from the EU to Russia, the European Commission led by the EU Commissioner for Energy intensively worked on alternative «Nabucco» gas pipeline project which will be able to transport gas from Iran, Turkmenistan and Azerbaijan over the territory Turkey, Bulgaria, Romania, Hungary, Germany, Austria and other European countries. However, the start up of the pipeline construction for various reasons was postponed several times and on June 28, 2013 the closure of the Nabucco» project was announced at the initiative of the Azerbaijani side which opted for the Trans Adriatic pipeline project (via Turkey to Greece and Albania, and eventually also to Italy). Another powerful the «White Stream» energy project was proposed in 2005 by Ukraine and envisaged the delivery of gas from Azerbaijani «Shah Deniz» gas deposits across Georgia through the Black Sea and further through Ukraine to Europe. In 2006-2007 the feasibility of the project has been actively discussed at various international conferences and forums of energy, but did not move the discussion forward. «South Stream» project in Bulgaria in mid April 2014 after a visit of Russia’s Foreign Minister S. Lavrov to Sofia on July 7, 2014 the leadership’s position of this European state now doesn’t look so categorical and consistent. Also, it was surprising to hear a controversial statement by Austrian Prime Minister regarding the advisability of the «South Stream» construction made by a senior official after V.Putin's official visit to Vienna on June 24, 2014. After all, the position of Italy on the defined issue released after the visit of Russian state delegation to Rome in July 2014 is viewed not less ambiguous. It was clear, the «South Stream» pipeline does not solve the EU key problem of decreasing the energy dependence and diversifying sources of natural gas supply. However, at the diplomatic level Moscow replays Brussels strategically skillfully using economic benefits and preferences in the energy sector proposed by certain EU states deepening further on the EU oil and gas dependence on Russia. Since, in the end it has taken the Kremlin less than two weeks to declare the consent of all interested countries to continue participation in this gas project. This is despite the fact that before the European community publicly announced of rejection of the euro zone countries to participate in the «South Stream» project as an important leverage of influence on Russia and the EU response to Moscow's aggressive policy towards Ukraine. A viable solution in this serious situation could be cooperation in energy issues with Iran as a potential strategic supplier of gas to the European space. Of course, the construction of gas pipeline from Iran through Turkey to the South of Europe is complicated by physical geographic factors meaning a high cost of construction, but even though in difficult conditions of fuel poverty the alternative of Iranian gas remains quite relevant to the European Union. Despite the old and worn out equipment of gas production field due to long-term regime of sanctions, Tehran is now confirming the readiness to offer the advantageous investment conditions to the European partners within the appointed energy project. In terms of diversification of sources and routes of energy supply the most promising for the EU is a construction of the «Middle East gas pipeline» that will stretch from Qatar, Kuwait, Iraq and Iran through Syria and Turkey to the EU borders. However, a number of problematic regional factors, including the kindling of a protracted civil war in Syria, threatening Iran's nuclear ambitions and activities of Iraqi radical rebels who from early June 2014 are engaged in fierce fighting with government troops for control over the largest oil refining capacities of the state. It becomes a kind of destructive retarder of real prospects for effective cooperation of European and Middle Eastern countries in energy field. Aggravation factors outlined above are largely the result of Russia’s foreign policy efforts interested in tensions escalated in oil region. It is not a coincidence that B.Sheyfer, a researcher of Center for Eurasian, Russian and East European Studies at the Georgetown University focuses on determination of the Russian state to achieve its energy dominance on the Eurasian continent and no stone would be left upon another on its way to the cherished goal. «To reach its goal of energy dominance in Europe, Russia has left no stone unturned, and those who got in the way have sometimes paid a price. In 2009, when Turkmenistan entered into discussions with the European Union about building a pipeline to Europe across the Caspian Sea, a gas valve was closed on the Russian side of a shared pipeline» [‎16] - says the researcher. Further, the author notes that Moscow has taken steps to block the access of Iran to the European energy market in 2006. It is when Russian company «Gazprom» bought a pipeline from Iran to Armenia and limited its size to ensure that it could be not used to carry Iranian gas into Europe [‎16]. In this way, Russia significantly limiting access of energy -dependent country to alternative sources of energy later modeled a situation when importing state occurs in a role of a business entity unable to pay its bills. As a result, the monopoly gas supplier «Gazprom» took over it domestic gas transmission systems and other energy infrastructure at the expense of debt liabilities. In 2014 Yerevan was forced to act by given scenario and got an absolute energy dependence on Russia, which was further deepening unlimited energy impact over its neighbor. (In the meantime, a few years earlier Russia repeated a similar algorithm using its monopoly position in energy market of Belarus and applying the price pressure forced Minsk to transfer the national gas transmission system in "Gazprom" ownership - auth.). Finally, the researcher is drawing a far-reaching conclusion regarding the inability of the EU countries to resist separately to Russian energy expansionism. In expert’s opinion, only consolidated cohesion and collegial decision-making in the energy sector should enhance the EU energy security and the world as a whole. Does Europe really depend on Russian gas? Recently, the European politicians objectively evaluating the threats in the energy security sector have been working hard on diverse programs to reduce dependence on Russian gas. Diversification of suppliers, setting up new routes for transporting gas, infrastructure development of renewable energy resources, investments in energy saving technologies, educating households about energy saving opportunities - this is not a complete list of effective measures to address the problem of the EU energy supply in the near future. Detailed analysis of root causes and global consequences of the Russian-Ukrainian gas war in 2014 allowed O.Volovych, a Ukrainian expert in energy geopolitics, to offer a reasoned review about likely changes and prospects on gas market. In particular, according to scientist’s projection within «the next 3-5 years in the frame of the «Southern Gas Corridor» a number of energy projects will be implemented, such as pipelines: TANAP-TAP; TKHP (Trans-Caspian Pipeline project), Iran - Turkey - Europe; Israel-Cyprus (Crete) - Europe . Also, LNG supply to be developed from Azerbaijan to Romania (project AGRI) and it is projected to increase supply from Qatar and the United States to Europe. This will significantly weaken the monopoly of «Gazprom» on the European energy market. Effort to resuscitate «Nabucco» Pipeline Project may be considered in the future provided Turkmen and Iranian gas to fill Nabucco» [‎19]. Recently, enduring growth of Moscow political influence on European countries through the use of «power factor» prompted the European Union to explore new options for efficient formation of modern system of collective energy security. So, in March 2014 Poland's Prime Minister Donald Tusk said that energy and financial dependence of the EU on Russia significantly limit the sovereignty of the European union, as a result Europe will be unable to confront effectively possible aggressive or expansive steps of the Kremlin in the foreseeable future [‎20]. Thus, in May 2014 Poland’s Prime Minister took the initiative and proposed to create a «European Energy Union» consisting of the EU 28 member-states and Ukraine [‎21]. The main objective of the initiated energy union is to confront effectively the energy pressure of Moscow by implementing the following measures to consolidate functions and to entitle the EU as authoritative entity of international relations with exclusive right to negotiate and sign trade contracts with Russia as the owner of «Gazprom» gas monopoly on the European energy market; to purchase Russian energy resources for the whole Energy Union bloc at the same price; diversification and improving security of the European market in case of limitations or supply-stop of Russian gas and oil exports; enhancing policy processes of the EU states in developing alternative routes and delivery schemes of energy resources to euro-zone, including the development of constructive cooperation with the Middle East states in the energy sector and the Caucasian republics of former USSR and so on; high financial flows to the development and improvement of the European energy infrastructure, especially in search and promotion of new sources of energy, expansion of renewable energy sources and so on. Propositions of Polish official resemble the idea of creating a kind of «Energy NATO» in a purely European representation that will act as a major collective guarantor and efficient tool for effective countering Russia’s energy expansion in Europe. However, in our opinion all declared objectives could be promptly implemented within the current European Energy community given the right political will. Of course, it would be possible on condition of strengthening its institutional capacity limited now by advisory and monitoring functions. Thus, working to a tight timescale and urgency of the problem it could be possible to reduce significantly the time frame for innovation and organizational structural costs for implementation of the abovementioned idea. At the beginning of May 2014 the Ministers for Energy of G7 countries agreed on a long-term «Plan to eliminate Europe's dependence » on oil and gas from Russia, which in their view should be an adequate measure to prevent the Kremlin from using the energy factor as a strong leverage for political pressure on the EU. So, the plan envisages creation of several new liquefied natural gas terminals in Europe, lifting of restrictions on the export of U.S. shale gas and to invest in new pipelines and so on. Today, European politicians examine and study carefully the possibility of project development on combining the whole EU states power systems (infrastructures of oil and coal industries, the power engineering sector, alternative energy, etc.) and newly formed consortium arrangement in close collaboration with respective capacities of other states located on the Black Sea, the Mediterranean Sea and the Baltic Sea. This will ensure a real opportunity to extend the legal framework of European energy legislation in the partner countries. In June 2014, José Manuel Barroso, President of the European Commission, assessing the disappointing realities of the present Ukraine-Russia gas dispute noted with appreciation the conclusions and efforts the EU has done in the aftermath of the gas crisis in 2009 to increase its energy security. «Yet, it remains vulnerable. The tensions over Ukraine again drive home this message. In the light of an overall energy import dependency of more than 50% we have to make further steps. The Commission has tabled a comprehensive strategy today which will be discussed by EU leaders in June. I count on their strong support, since increasing energy security is in all our interest. On energy security, Europe must speak and act as one» [‎9] - concluded the head of the European Commission. Thus, based on these facts the above can be summarized briefly as follows. In modern terms of polycentric system of international relations Russia skillfully uses the system of granting discounts and special arrangements recorded by classified annexations to the energy contracts on gas supply to European states and in fact creates the «energy Entente» in the European space. In this respect Moscow is purposefully forming a coalition of loyal «pro-Russian» states whose representatives openly or covertly are lobbying Moscow geopolitical interests in the European theater. Today, the widespread use of «energy weapon» by the Kremlin in the post-Soviet republics led to the acceleration of integration and intensification of cooperation with European countries, which are also affected by aggressive Russian energy policy. Today, the issue of pan-European energy market is at the stage of public discussion in an open dialogue and applied research and expert discourse. There are instances when there has been noticeable increasing of consolidating trends in the EU positions in establishing and organizing an effective system of a European collective energy security. A clear awareness of the benefits of Russia’s resources and negotiating capacity in bilateral intergovernmental cooperation with any country of the EU in the process of solving energy contradictions encourages the European Union to introduce an algorithm of collective decision making and formation of certain alliance of European energy consumers and transit countries at the level of supranational institutions. At the same time, official Moscow demonstrates an interest in further expanding its market share in Europe, initiating flexible variety of preferences for its European importers. Provided, that Russian economy or rather «energynomiks» is excessively sensitive and absolutely dependent on energy revenues volumes this attempt of the Russian Federation is quite clear and natural. After all, if Russian monopoly on the European energy market will be lost and energy prices will arrive at the «reasonable» and economically sound formula, i.e. in case of formation of adverse conditions in the global energy market Moscow would not only get rid of a powerful factor of geopolitical influence. The «energy weapons» can become a destructive factor against a state in whose possession it has been found and might be proved to destroying Russia’s economy and social system and undermining its political setting from within. However, Russia's annexation of Ukraine’s Crimea and backing the separatist movements in eastern Ukraine combined with the Kremlin demonstrative and exemplary pressure on Kyiv became a wake-up call for the world and the reason for imposing economic sanctions against Moscow. Also, the above actions can catalyze diversification of the European energy market. In this context with the purpose to support the EU in its aspirations to achieve energy independence from Russia, the United States in the search for solutions to overcome a menacing situation expressed readiness to enter the European hydrocarbons market with an offer of shale domestic gas in the near future. Therefore, according to S.Lewis, an American expert, subject to sanctions Russia pointedly turned the attention towards Asia signing 30-year gas deal with China in May 2014 and demonstrated in this way its independence from the European energy market in the near future [‎9]. First of all, in implementing the China contract Russia intends to change the balance in the Eurasian energy market, diversifying its own risks and at the same time strengthening potential threats to European states in this field. So, what does it all mean, especially in light of what is going on between Russia and the West? First, do not expect Gazprom to abandon its efforts to hold market share in Europe. In fact, by many respects the infrastructure projects that Russia has recently developed and is actively pursuing (North Stream and South Stream) are endeavors aimed at bypassing transit country risk and maintaining market share in Europe. Moreover, buyers in Europe, particularly in Germany and Italy, have long-standing commercial relationships with Gazprom, and the importance of this cannot be undersold. It will, however, be very difficult for Russia to not lose some market in Europe particularly as central European countries - which depend most heavily on Russian supply - try to diversify away from Russian gas. But just as the US could use free trade status with the European Union as a credible threat to Russian dominance in the European gas market, Russia can tilt its market focus toward Asia to demonstrate that it is not as dependent on the European market for the long term health of its energy sector as many in the West would like to believe. Indeed, the West may have overplayed its hand in thinking it could impose sanctions and deeply harm the Russian energy sector. If anything, Russia has demonstrated that it has a willing customer in China and, moreover, that it is willing to substantially deepen its economic ties with China. Anne Applebaum, an American journalist, reviewer of The Washington Post believes that today the actions of the Russian side affect not only East or West regions of Europe on separate, but also bring pressure on the international energy market as a whole. After threats to suspend or restrict the gas delivery to certain euro-zone areas Moscow explicitly applicate advantages of "Gazprom" destructive monopoly potential and its destructive impact on the politics and economics of European states. Applebaum recommends the EU thinking strategically about its future would create an energy union, as some have already suggested, for conducting joint negotiations with Russia regarding formation of pricing mechanism, logistics and volumes of oil and gas deliveries. Also, the expert advises the EU to step up construction of the infrastructure needed to import, transport and store liquefied natural gas (LNG) in the euro-zone [‎1]. In this sense, the legislative proposal introduced by Ukraine’s government to Parliament might be of interest for the EU. This legislation concerns the purchase of 49% of country’s gas transportation system to European and US investors. Given that there is a powerful system of the underground storage facilities that can accumulate about 35 billion cubic meters of natural gas and in case of European investment in this project the innovation could significantly strengthen the EU energy security and get rid of seasonal dependence factor on Russian gas. Thus, reducing the threat and possibility of geopolitical pressure from Russia. Indeed, in the present conditions of high commodity dependence of developed economies, energy security is an inalienable attribute of national sovereignty and political autonomy of every independent state. Today, Russia widely uses the energy factor over the European space as an element of «hard power» in its relations with the Commonwealth of Independent member states, the Baltic states and Eastern European states that once had belonged to the sphere of influence of the Soviet Union. Setting excessive, economically unjustified and often politically motivated energy prices, in some cases heavy conditions for mandatory prepayment of hydrocarbon supplies and requiring the predefined amounts of energy purchase regardless of the current needs of the importer, Moscow tries stubbornly to keep disastrous dependence of European economies and impose a political line of conduct in exchange for easing in energy issues. However, the Russian Federation clearly manifests a «sophisticated» use of energy factor as an element of «soft power» applied to relatively efficient economies of leaders of the European community. In particular, Moscow established a «sophisticated» system of preferences and introduced the differentiation-indulgence pricing strategy on «Gazprom» energy products exported for certain EU states which are politically «attractive» with regard to the Kremlin. In return, Russia asks to make some concessions of geopolitical character and loyalty to the Kremlin in case of aggravation of situation at the global level. The economic inconsequence of pricing policy in the energy sector is particularly evident taking into account the transport component. For example, gas price for some Western European countries is much lower than the contractual cost of natural gas to the Baltic States, although they are geographically much closer to Russia’s borders. Finally, having summarized and analyzed the above facts and arguments it is possible to note confidently the intention of Moscow current energy policy in Europe to create a modern system of neo-colonial relations in the «Russia - EU» format, where according to Kremlin’s plan each of the European states plays an assigned role in a subtle combination promoting Russia’s strategic interests on the European stage of world political theater. The power factor acquires features of «hard» or «soft» power through skillful combination of Russia in European energy policy according to the characteristics and specificities of interstate cooperation with each country of the European Union, becoming a powerful geopolitical weapon and tool of use of «smart» power. However, these aspects of energy relations of Russia in the European space should be the issue of separate research and broader coverage that goes beyond the scope of this publication. Under such circumstances, in search of answers on the EU's energy independence issues and ability of Europe to counter effectively Russia’s energy expansionism let’s present a short presentation of author’s vision regarding a possible set of political and economic tools of prevention and counteraction to neo-colonial Russian energy policy at the present historical stage. 1. Diversification of European energy market through the introduction of alternative sources of supply and routes of energy transportation with a reduction of Russian gas supplies to the EU. In recent decades the economic interdependence between the European countries and the Russian Federation on export-import operations in the energy market has strongly increased. Also, the Russian budget gets almost 90% revenues of the total gas export from the European destination, while Europe for its part sourced from Russia about a third of gas volume required for viability of the regional economy. Today, «Gazprom» company does not have necessary transport and sufficient technical capacities at its disposal for prompt realigning (reorient) of hydrocarbons export via alternative routes. In fact, «Gazprom» has become a hostage of the European gas market. Instead, monitoring the Europe’s dependence on Russian gas imports in historical perspective we have to note a significant reduction of this proportion of natural gas of total energy consumption in the region. For example, in the 1970s-1980s the European countries imported nearly 70% of the required volume of gas from the Soviet Union, in the 2000s the share of supply was about 40% only. Moreover, in the period of 2000-2010 Russia’s gas supply to Europe was of sustainable character and balancing in the range of 130-160 billion cubic meters per year. Thus, Russian gas export to the European Union gradually decreased without taking special painful restrictive measures, by the so-called «natural» market economy and stabilized at a level addressed by the needs of continued functioning of the regional economy. However, under modern conditions of over politicization of energy relations between Russia and the EU states the situation requires deliberate and effective measures of the European Community leadership for optimization and diversification of energy resources in the region in the context of creating a single European energy market. The EU Energy Commissioner Günther Oettinger discussing the modern concept of the EU energy security on the pages of The Frankfurter Allgemeine Zeitung newspaper noted that streamlining (synchronization operation - auth.) of the European pipe system would be the optimal way for reducing the euro-zone dependence on Russian natural gas. According to a senior official, in urgent need this step will allow easy transportation of energy supply in the required volume to all EU countries. As a result, the market itself will align the prices and «Russia will not be able to blackmail those EU countries that cannot import gas from other sources» [‎14] - emotionally stated the Energy Commissioner. Consequently, the risk of critical unilateral reduction of Russian gas supplies to Europe has potentially existed for several decades. Nevertheless, the deterioration of Moscow and the EU relations due to excessive growth of Russia’s imperial ambitions in recent years spurred the acceleration of this destructive scenario. In addition, after gross annexation of Crimea together with very aggressive behavior of the Kremlin in the east of Ukraine and open energy blockade of Kyiv, the European politicians received further arguments and convincing motivation for accelerated implementation of diversification project of Europe’s gas imports. In author’s opinion, despite the fears of European states regarding possible US undue influence on the EU foreign policy Washington is almost the only influential ally in energy issues creating the effective system of European energy security countering Russia’s excessive pressure. The EU caution concerning the unlimited US dominance in addressing security issues of the European Union is quite clear. However, it must be objectively acknowledged that Europe now is unable to resist Russian aggressive energy policy. Namely the United States with their powerful energy potential and significant influence in the Persian Gulf region, which at present is the «planet energy storehouse», can in a short time offer the EU a quick alternative source from «close embrace» of dangerous energy dependence on Russia. Europe needs to work out practical schemes of partial replacement of Russian energy supplies in its own market. Ideally, based on scientific and export findings a balanced system of equal dependence of European economy for energy supplies from Russia, Middle Eastern, Central Asian and American should be created. Moreover, the power supply and carbohydrates transportation to all destinations should have full potentials, a significant rapid increase of energy exports. This will allow diversifying supply sources of raw materials in the event of changing political situation in respective vectors of international cooperation. This kind of project will create a model of modern political equidistance and the EU energy independence having rid of excessive care and intrusive influence of various centers of power in modern geopolitical space. 2. The creation of a single European energy market is a priority EU objective in the area of regional security and promotion of strategic interests on the geopolitical level. Today, the idea of creation of a single European energy market has been widely debated by the European political establishment and actively lobbied by Eastern European and Baltic states most affected by discriminatory tough Russia’s energy policy on the EU territory. In this regard, understanding of the urgent need and a fundamental willingness of the majority of the EU countries for revision of structure of relations with the Kremlin in the energy sector has become is a significant landmark. Today, the current development of energy relations between the EU states and Russia in the form of energy institutions of each EU state and Russia’s state-monopoly power corporation has not justified itself. After all, Moscow is widely applying energy factor on the EU territory not only as an element of «hard power», but also uses it as a component of unhealthy competition and political destabilization within the European Union countries, creating problematic preconditions for possible ability of the states of the European community to speak in one voice in defending the regional geopolitical interests. Being skilled in energy sector Moscow sowed discord in the camp of European countries through the introduction of various preferences and installation of «floating» subjectively unreasonable market prices by not allowing to consolidate and jointly defend strategic positions in geopolitical terms. It is, in many ways thanks to the efforts of the Kremlin, today the Polish initiatives have been blocked in the EU regarding the formation of a single European energy market and transparent pricing on it. As a result, the power factor becomes an increasingly destructive potential and obstacle to make a sound collective judgment regarding the foreign policy decisions within the framework of the European Commission and the European Parliament as a whole. Therefore, to give an adequate assessment of the threats carried by atomized position of the EU states in the energy sector, they should realize the importance of an objective of creating a single energy market in the context of strengthening the EU position in the international arena as a monolithic supranational association. It is fully understandable that some EU countries disagree on the issue of creating a single energy market due to significant discounts and special contractual preferences by Russia on imported hydrocarbons. However, it is quite difficult to justify benefits prevalence of national economies over geopolitical strategic interests of the European community. In our view, a possible compromise solution from ambiguous situation of contradictions of interests at the initial stage is the creation of the EU reserve anti-crisis fund. The main objective of the fund will be a function of compensatory payments that enable to cover the potential financial losses and the EU economic benefits considered not to have been received in order to overcome the energy precautions in the development of basic consolidated EU position on security issues and effective countering Russia’s neo-colonial policy today. Now, the implementation of the effective system of collective energy security should be a priority direction of political and economic activities of the united Europe in order to ensure its future as a major independent player on the geopolitical chessboard. Instead, for further productive cooperation with Russia’s super power energy supplier it is proposed to create a single European energy sector, which on behalf of the community of the united EU member states will present an agreed consolidated position of euro-zone and negotiate with Russia on the purchase of the necessary amounts of energy commodities. In such circumstances, distribution, transportation and pricing formation on energy carriers remain purely the internal European affairs of referring to a function of above newly created supranational authority in the energy sector. Today, in spite of difficult financial and economic situation and difficult political realities the EU should consistently generate its own geopolitical space and actively and pragmatically work towards formation of supranational geopolitical and geostrategic economic interests of the region on the world map including the energy security issues. With the purpose of successful implementation of mentioned priorities the EU should formulate a general strategy for the promotion of regional interests in all areas of international cooperation, especially in energy field looking beyond national interests of individual actors of a supranational union. This will allow positioning the European community as an influential player of the geopolitical space in a multi-polar world order. Only the consolidated EU position as an influential independent center of power in the world politics is able to counter effectively Russia’s great power imperial ambitions in Eurasia. It should be noted that the deterioration of Russia- EU relations at the present stage where the «Ukrainian question» serves as catalysts is an important geopolitical argument and basis for focusing on strengthening the EU energy security and escape the harmful impact of Russia. Of course, to conduct thorough research and make valid mathematical calculations in the energy field of international relations you need to have access to negotiation records, archive documents, and «Gazprom» classified annexations to the energy contracts. Also, it is necessary to get acquainted fully with the content of the contractual obligations between parties, including secret agreements and terms of contracts. However, using open and publicly available information we can observe threatening trends and reach not encouraging findings regarding the prospects of an effective EU - Russia interaction in the oil and gas field provided that the existing arrangements have been preserved at the international level. 3. Cline R. World Power Trends / Cline, Ray S. Scalapino, Robert A. Simes, Dimitri K. & Wells, Samuel F. eds. Main Trends in World Power: Political Impact of Strategic Weapons. [Washington]: The Center for Strategic and International Studies, Georgetown University, 1978. –Р. 1−29. 5. Dahl R. The Concept of Power // Behavioral Science. – 1957, II July. 6. Evans-Pritchard, Ambrose Europe scrambles to break gas dependence on Russia, offers Ukraine military tie. The Daily Telegraph (21 Mar 2014). 10. Morgenthau H. Politics among nations: the strugglefor power and peace . Brief ed. –N.Y., 1993. -419 p.
12. Nye J. S., Jn. The Powers to Lead / J. S. Nye, Jn. – Oxford: University press. – 2008. – 226 p.
13. Nye J. Soft Power: The Means to Success in World Politics. / Nye J. –New York: Public Affairs Group, 2005. – 191 p.
15. Russel B. Power. A new social analysis. – London, 1938. -328 p.
17. Stossinger J. The might of nations. World politics in our time. –N.Y., 1963. -475 p.
22. Слободян Н.В. США та Російська Федерація в Перській затоці : союзники – суперники : [Slobodian N.V. USA and the Russian Federation in the Persian Gulf : allies – rivals]. – Kiev : «Poligrafia plus», 2014. – 396 с.